Basically just a Debug Menu for screen effects. Allows player to change/test an assortment of different screen effects in real-time to help find one that looks good. No configuration need for files. Automatically reads all files and RTPs for images. Hide button to make windows invisible while held to get better view of game screen. # - Improved coding. Shortened. # - Totally re-written. Code has been vastly improved. # folders and RTPs (even custom ones) and adds all the images for each. # view the effect you are testing. # - Configurable call button to bring up the menu. # - Duration for screen shakes and weather. # - No known script compatibility issues. # - Place script above Main and below other default scripts. # - During test play, press F8 (default) to bring up the menu. # life easier when trying to find a good screen effect. # version 2.0 or higher, you do not need to configure this. # Settings for the window. Purely aesthetic. No one else should ever see it. # Button used to call scene from Scene_Map. # Button used to hide the windows. Windows will not be visible while held. # Set current screen tone. # Set current weather type, power, and duration. # Set name, hue, opacity, zoom, blend type, sx, and sy of current fog. # Set name and hue of current panorama. 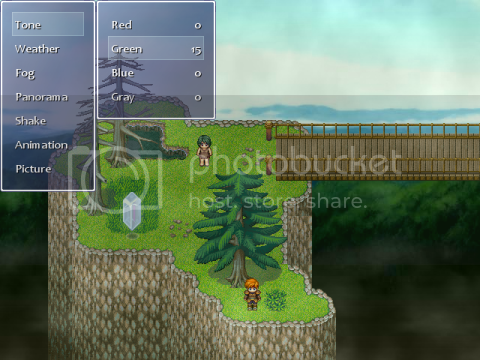 # Find all filenames of panoramas, fogs, and pictures in the game. # Create the main window. # Set strings for the menu options. # Check for variable used in Zer0 Advanced Weather and MAWS. # Create window array. Holds all created windows for easy handling. # Set font name, font size, and opacity of main window. # Transition graphics and begin main loop. # Dispose of the sprites. # Update window and map sprites. # Return to map if main window is active. # Else find active window, deactivate it, and return to main window. # Branch update method by what window is active. # Play SE and deactivate main window. # Branch by main window index, creating new windows when needed. # Create an array of possible weather types. # Apply weather effect to screen. # Set the configured look to all the windows as they are made. # Search "Fogs", "Panoramas", and "Pictures" folder for files. # Add all files from RTP into their respective arrays. # Iterate through combined folders, and omit all non-image files. # Remove nil elements and add 'None' string to each array. # DO NOT edit any of these lines. They are used to gather the RTP data. # Get the dll used for the game. # Set constants to call path with. # Creates an event on the fly, plays the animation, then disposes it. # Loop Graphics and sprite update as long as animation is occurring. # Create sprite if it does not exist. # Add to picture array, so it automatically updates and disposes. # Clear bitmap and end method if no bitmap is defined. # Set the configured data to the picture. Place script below default scripts, and above "Main". Call scene with F8 (default) during test play. See script for instructions if needed. No known script compatibility issues. Please report any bugs/issues/suggestions. I will be happy to fix them. I upgraded it to Version 1.1. It has added compatibility for my Advanced Weather script, so now the weather variation can be changed as well. Another exceptionally useful script. I make extensive use of color change and customized fog settings, and this has already proven to be an invaluable part of my testing process. I'll rate you again tommorrow morning when I can. Script is totally new. Added a bunch of new features (see "Features" header). Waaaaaaaaay better coding. The original was one of my first scripts, so needless to say I have improved my scripting knowledge a little. I highly suggest that if you used/liked the original, you scrap it and use this one. It is better in virtually every way, and looks better, too. Just a little question, why is the Demo link liked to your Advanced Title 2.0? I love this script of yours. It has removed nearly all the guesswork when it came to my games settings. I'll check it out. I don't remember ever getting that error when testing. I may have messed something up when trimming down the game for the demo. Did I erase the Panoramas folder from the Graphics folder. I don't have the game with me at the moment. EDIT: Another thing I though of that may cause a problem is where you define your RTPs. Make sure that there are none there that do not exist, else the script will attempt to load the graphics from them, causing that error. Not sure if that is the problem or not, just a possibility I thought of. I think I would have got another error then, but anyway. It works now. You have removed the Panoramas folder. I don't know why I didn't see that, but that doesn't matter. Thank anyway. Sorry to bump the script needlessly. I went to test the download for another project I'm working on, found that it was removed, and updated the link. No changes have been made to the script at this time. Hey I found a small bug. The fog test, the scrolling can't be made lower then 100 for both x and y.
Oops, you are correct. I apparently was attempting to keep the parameters within a range as if it were a zoom level. The values of 800 and -800 are actually rather arbitrary, you can set them as high and low as you like. In fact, on second look, I don't even see why I even was trying to limit the values. You can even delete/comment out this line entirely, which will take away the limiter on how high the scroll values can be set. Anyways, thank you very much Taiine for pointing it out. put those stuff that you've tested immediately without having 2 close the test play or Game.exe into any selected place in any selected events. I don't even know what you mean by that. You want the values to be set in the editor to the ones that are being shown on the screen? If so, a rebuild of RMXP's engine would be required. You're more than welcome to try. I did hear about someone trying to do that. "ARC" or something like that I think is what they were calling it. They are all a bunch of degenerates, though, so don't hold out any hope.